Ask Metro: Why does MetroLink Work Happen During Large Events? Q: Why does MetroLink maintenance happen during large events? A: The original MetroLink alignment is now 21-years-old and some of that system is scheduled to be updated. 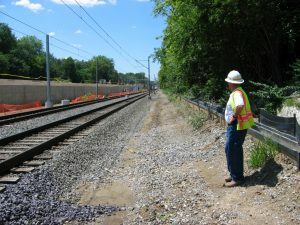 MetroLink has a very active maintenance program, including work that has to be performed on MetroLink tracks, signals and overhead catenary wires. To the greatest extent possible, we perform maintenance work at times that will minimize the impact on our customers. In fact, much of our work is performed late in the evening and on weekends. However, there is simply not enough time between the end of service in the evening and beginning of service the next day to perform all maintenance activities during non-operating periods. St. Louis is a vibrant city with many special events, including sporting events, festivals and conventions. While we do strive to avoid the very largest of events, we inevitability encounter some special events during our maintenance periods. For the latest updates across our MetroLink system, including delays due to planned track maintenance, make sure you check out our Rider Alerts page.